Regular readers may have noticed that I have not posted a blog in a long time. There is a reason for that: I could not come up with anything that was as interesting as all the other news that has been going on of late, so, rather than fail out of the gate, I gave up. However, now that I have had some time to recover and reflect on what I am observing day to day, I hope I can offer something that actually may be of some use. It is a simple yet grand question: how the hell did we get to this sorry state of affairs as a society and as a nation? People who know me know that I rarely take anything at face value as mere phenomena. I always look for the underlying fundamentals that have produced whatever we are observing. Is it just natural and normal for human beings to behave the way we have been of late? Or is there something manipulating us into this way of action? I will start with this observation: There has been a disintegration of language. The language itself has become corrosive. I myself, have had my own language corrupted. This has happened even though, for my entire life, I have prided myself on my command of the English language. From an early age I was often told that I had “a way with words,” and I debated successfully with my English teachers as to how language works . . . But now, as a force of habit and as a reflection of the emotional dialects I hear all day every day– I am finding it difficult to speak in open forums in terms and phrases that do not carry a kind of electrical charge of shame, anger, and/or protective preemptive disdain. This is understandable, since so many voices I hear speak this same way and strike me as needing and deserving such a response. But wait– is this just the inevitable order of things, or– was it foisted upon us? Here is my theory: language is simply labels we put on experience. And our collective and individual experience is, more and more, becoming one of isolation and abandonment. If you place a person– or, for that matter, a dog or a cat– into a state of isolation, they will start to deteriorate emotionally. Their language starts to become labels for that experience. Every problem starts out in life as a solution, and one problem we now have is the solution of too much isolation, even within crowds. For example, take “education.” High test scores are fine by themselves, but consider the cost– In Sweden, they have eliminated homework and tests because they figured out that the real learning, personal development, and growth occurs best when kids interact with other people, not from being immersed (read: emotionally isolated) in homework and tests. Just as every battleship means 27 hospitals not built, every hour of homework or Facebook or Youtube is an hour spent away from the company of our own kind. This profitable, even sometimes well-intended lessening of genuine social interaction has led us to here. Freedom of speech morphs easily into license to kill if there is no real tribal connection that one can lose by abusing precious trust and connection. If you have nothing to lose, if there are no consequence of loss of connection, or social joy to be lost due to lack of etiquette, the incivility that rises from, and seeks to conceal, the underlying aloneness takes over. If I am separate and lonely, then my language consists of labels for the ensuing pain and fear. Let’s look past the labels and understand that we have been sold a bill of goods. There is always a tradeoff, and the empty emotional calories of social media and every moment spent staring at a computer screen, or a test, or a textbook, is, in the final analysis, time spent alone. And aloneness is always the gateway to the most destructive emotions and actions. In the construction trades, there is a delightful phrase known as “a real s**t show.” This refers to a building that needs new siding, but you can’t put up new siding because the framing underneath is also rotten, but it can’t be replaced because the foundation is cracked. You can’t patch it. It can be fixed, but you have to rip it up and start all over. Bad as it is, we can fix our situation. But first we have to get past our stoic denial, and realize how badly we have all been treated in order to be this far downstream communicating the way we do. Like most people, I am still wandering around in a dull state of shock after all the emotional hits of 2016. Regular readers know I am always trying to figure out maps of human behavior in order to acquire some sense of control. And here is my latest: I call it Binary Tribalism. Tribes: We now have political tribes, not parties. Note that tribes are different. There were not 12 political parties of Israel, there were not Apache political parties. Tribes are extensions of family, they are much stronger bonds of belonging and shared beliefs. They demand strict adherence to dogma that may conflict with math or physics, and they invoke willingness, even eagerness, to defend the tribe to the death. Again, referring to my general rules and maps, people seek power, and once they get it, they seek to consolidate it, and once they consolidate it, they seek to expand it. To that end, it is my belief that the true power elite are seeking to expand their power over the rest of us even further, by using the ancient Roman policy of divide and conquer. This is why we now live in a world of binary tribalism. Individualism and independence are being crushed at every turn. This is why we are all so exhausted right now. Our inalienable right to the pursuit of happiness has been alienated. This is not an accident. “Nationalism” – single tribalism– worked for Nazi Germany, because they were a small state that needed to be united. France, England, Jews, and Communists were handy pre-existing opposing tribes to unite against. Of course, propaganda always misrepresents the members of the opposing tribe. Without the USSR, America is now too big to be managed as a single tribe, it has to be broken up into two diametrically opposed groups. To that end, we have taken a few relatively minor social issues and blown them way out of proportion. We have also been loaded up with massive amounts of disinformation, in order to to be conditioned to fear and hate eachother. And that is what is being done to us, a nickel at a time. Death by a thousand sponsored posts. In a world of such evil, you are told again and again that you cannot survive or function individually; you must join a tribe. And again, binary tribalism, you are forced to choose between one or the other, and once you choose one, you must immediately disavow and detest anything that smacks of the other. As I explained in my latest book, the need to belong is one of the most powerful human emotions. That need can be exploited for good or evil, and if you seek to divide and conquer, the easiest way to do it (and this has been done to humans since the dawn of civilization) is to create opposing tribes of near equal power. If a teeter totter is on perfect opposing balance, even if there are a thousand pounds on each side, it takes just a pinky finger to push it one way or the other. There is tremendous social and economic pressure on all of us to become members of one tribe or the other. Membership requires despising all members of the other tribe, and the power and malevolence of the opposing tribe is always exaggerated to create more and more need to join up. Life is a complex predicament but we are forced into a simplistic binary system. You are either liberal or conservative, blue or red, republican or democrat, right or left. To not be in one tribe or the other is to be a nondescript barbarian with no rights at all. And whichever tribe you are in, it is all right and righteous, and the opposing tribe is all wrong, misguided, and evil, as are its leaders. At the risk of being ostracized, I will conclude with this: Neither tribe is entirely good nor entirely evil. The word “sin” means “to fall short of one’s highest potential.” In that meaning, we are all sinners. The evil of the opposite side is often magnified to obscure or rationalize the evil of our own. That said, there is a third tribe of sorts: It is a third-party malevolent force that seeks to drive us apart into warring tribes, enervating ourselves into an easily controlled mass. The history of the world is about two genetically identical groups being split into warring factions, thus giving power to a few. Seeing this requires a bit of calm objectivity about the self. This onslaught of propaganda hits us all. But you have the power to say no. Freedom means having the choice to not bow to the dogma of the tribe. This choice is what so many Americans have fought and died for. A broader understanding of our susceptibility to tribal membership drives, and a broader consciousness of our freedom to make individual unique choices, just might make America truly great again. So I gave a talk to a group in Foxboro MA last month, and the local cable station did a great job of shooting it for me– below, 3 excerpts. Two are classic stories from Real Men Don’t Rehearse, and the last is a little intro to my latest book Time Light Love. First, What is a lunch? A little look at the union/ trade agreement tussles that happen in a professional orchestra. Students of history may recall that in the wake of large disasters, people have seen the need to take steps to make sure such disasters don’t happen again. For example, after World War I we created the League of Nations, now known as the United Nations. After World War II we stationed troops in Germany. The lack of any organized method of dealing with Civil War dead led to the creation of the Red Cross. The lack of any rules for handing prisoners of War led to the Geneva Convention. After the Coconut Grove fire in Boston (and similar such events) we instituted Fire Marshals and fire codes to prevent such things from happening again. When movies got more and more risque we came up with a rating system for what kids can see and what they can’t. Not perfect solutions, but way better than what was. Now I am not going where you might think. The national disaster I think needs to be avoided is the disaster known as our current level of civil / political discourse. It’s not good. It’s causing great psychological distress. Not to mention a rift in our national fabric. So my proposal: the creation of The Women’s League of Political Temperance. I can’t really say why it should be a women’s league except that, well . . . I just think women are better at this than men. It’s a tradition. Women just have more interest in social mores, and they also have more power. “If momma ain’t happy ain’t nobody happy.” The whole topic of what is proper social behavior has always been the bailiwick of females. I think it is time for women to rediscover their power in this regard. It would be dicey of course, but if enough women got together and started saying to the major media “stop speaking in such inflammatory rude tones” with the threat of boycotting sponsors of the shows airing such, I think this might be a very good thing for society as a whole. I am all for freedom, but there is a difference between freedom and license. Freedom does not mean you can do whatever the hell you want without regard for the consequences. It’s up to you, ladies. All we need is a little leadership. Back in the 1920’s, when Henry Ford was running his massive factories, all was well for him except for one problem: the union. He was not at all happy about the prospect of his many thousands of workers getting organized into a union, and thus being able to demand concessions for themselves. Being a pragmatic sort of fellow, he decided that the best way to keep unions from forming was to keep his workers from talking to one another. He actually had gangs of “goons” whose job was to physically intimidate, and even viciously beat, any Ford assembly line worker who looked like they were conferring with any co-workers. Unfortunately, his efforts ultimately failed, as the workers found ways around his clunky methods. I experienced a similar situation in the industrial poor-kid elementary school I attended, which was based on the car factory model. Even though communication skills are key to success in life, if any of us made any attempt to communicate with fellow students by passing notes or talking in study hall, we faced severe corporal punishment. But let’s make a grand mental leap here, and instead of trying to maintain control over a Model T Ford factory or a classroom of seventh graders, let’s assume you are trying to maintain control over an electorate of 175 million people. How would you do it? Various police states have tried to keep citizens from chatting amongst themselves by using fear of violence, but as Henry ford and my third grade teacher discovered, the use of brute force ultimately does not work. What to do? Well, one nifty way to keep voters from communicating with one another is to simply create an environment where they don’t want to communicate with one another. This is far more effective and efficient. So . . . if you flip thru Fox News or the AM radio dial, you will find station after station of people informing you of how disgusting, criminal, immoral, unethical, sexually deviant, and just generally cooties-infested all the people are who are on “the left.” And if you flip through the liberal media / intellectual NPR Radio/ blogosphere or Comedy Central, you will find the exact same message of how disgusting, criminal, immoral, unethical, sexually deviant, and just generally cooties-infested are all the people on “the right.” If you remove your own bias, approving of one and tsk tsk-ing the other, you will see that the emotional responses they are trying to evoke are identical mirror images of one another. Is life really so simple that there are only 2 opposite ways of doing everything? Can a state only be blue or red? Most of us are actually centrists with many common interests, such as aging bridges and gas and water pipes. But that is not how Voters Inc. works. Like the farm factories (See “Food Inc.“) that have carefully and relentlessly redesigned cows and chickens to suit their purposes, the real underlying purpose of the vast political propaganda media industrial complex (of which the “parties” are a mere subdivision) is not about “issues.” Issues, visions, and policies are secondary to simply acquiring and maintaining power. Like industrial farmers who work with chickens or corn, the owners of Voters Inc. think strategically about voters, i.e., how they can inject us with hormones of fear and anger to alter how we normally function, to suit their grander purpose. They do it on a massive industrial scale. And like the food conglomerates, they shun the spotlight. If the overriding number-one goal of the people with the most power was simply to create an environment where consensus among the middle and lower tiers of society is impossible, would our current situation, where a 49 % – 49% even split of totally opposite irreconcilable differences is the norm, not be a near perfect manifestation of that goal? All the emotional noise-making that you see should not be taken at face value. Even those in office who execute the planning are not conscious of it. It all has a shadowy hidden purpose. It is all carefully designed to distract, and cause so much emotional distress in the moment, that is it very hard to see what is really going on. It just makes it feel “icky” to seek compromise and consensus. Thus we are all relegated to minority status, being members of, at best, a 49.5% minority party that can never make the changes that most of us want. The next time you are feeling incensed, disgusted, or shocked at the statements or positions of some leader of an opposing party, stop and think . . . is this the entire story, or . . . is it all part of a grand ruse to distract you and make it impossible for you, on a deep gut level, to find consensus with your fellow citizens? Isn’t it all just a little too symmetrical, a little too consistent, a little too absent any centrist news stations? Is your delicious sense of contempt and moral outrage evidence of your being played? Being an occasional author and speaker, I spend a fair amount of time observing the act of communication. But I am having trouble with this easy answer, because there are people who can do calculus and other complex tasks who yet seem to be unable to see, comprehend, and acknowledge obvious facts. After observing this for a while, I have come to understand what I call the mind lid. Eyes and sight are wonderful things. Well, most of the time they are. But every once in a while there is a bright flashing light and it hurts to look at it, so we close our eyes. We occasionally cover our ears and hold our noses too, but the eyes have their own mechanism. And the mind has this capacity as well. Just as the eyeball has the capacity to shut out painful levels of light, the mind also has a capacity to not acknowledge certain information. Actually, the brighter the light, the more the eyes shut in response. This attribute of the mind is way too juicy of a vulnerability to be left alone by those who seek greater power by any means possible. It is just a theory, but I do believe that much of what is going on in the USA these days, politically, economically, and artistically, all has to do with the misuse of this attribute of the mind. You see, the more you introduce ugliness or unpleasantness, the more the mind has to shut its perceptions down in order to cope with the pain. Once a large number of people have shut down their own perceptions to protect their spirits from extreme ugliness, they are now intellectually blinded, and must rely upon some other entity for guidance. From a certain angle, this can be very handy. People who think for themselves are the bane of political parties and con artists. If people being intellectually blinded benefits you in some way, you are incentivized to introduced as much ugliness into the public discourse as possible. Leaping to the side, I hate to be the one to say it, but an awful lot of art we see these days is just . . . ugly. You can call it lofty or high or abstract, but at the end of the day I have to numb myself in response to it. Art, in my opinion, should be something so gorgeous and pleasant that you actually want to raise your mind lid to better drink it all in, even if that means seeing painful things that you once closed your mind to. I think this is one of art’s primary social purposes, to open perceptions. But when someone plays an abstract piece of music that is just rambling atonal noise, the final result is a callous growing over my perceptions to cope with the unpleasantness. Something similar happens to children of dysfunction; when they grow up, they may have managed to blind themselves to the pain of their past, but then they have kids, the kids force their mind lids open to stuff they don’t want to look at. We all like to think of ourselves as conscious logical creatures, but this is simply not the case. Everyone, and I do mean everyone, has to limit their perceptions, otherwise the swings from ecstasy to excruciating pain would make us non-functional. We have to have eyelids to make it through the day. We also need mind lids. Leaping to my grand conclusion, we should not get too distracted by the individuals who are currently running for office. They are not the vile enemy. They are just tools of the political and economic forces that hold so much sway over the electoral process, and the uglier these propagandists can make life appear, the more blinded and thus less able to see the wider truth we all become. As I read it, I of course found myself agreeing with most or all of it. Yes, the public schools have problems, and he offers some fabulous ideas for how to improve things. There seems to be no lack of intelligent critiques of the mainstream public school system, nor is there any lack of marvelous ideas for how to improve it. Tens of millions of people have read these books or watched these presentations, so promotion has not been a problem. But despite all these suggestions, there have been no major changes in the 40+ years that I have been observing the educational industrial complex. Yes, there are pockets of changes and successes here and there, and many private schools have been doing this stuff from the get-go, but the mainstream public school “blob,” as some call it, has not changed significantly, even in the face of Finland’s demonstrated successes. In fact, as standardized testing has become more prevalent, one could even argue that things have gotten worse, if you agree with Holt’s Tyranny of Testing. I have a different conclusion here than what you might expect. I am starting to see a dark side to all these recurring education manifestos and TEDtalks and books and programs. Functionally, for all their noble intentions, they are inadvertently working against their own stated goals, because by repeatedly presenting these retreaded idealistic visions of an education utopia, they are creating an illusion for the general populace that something is being done about the problem, when little or nothing really is. This illusion feeds denial and complacency, and robs us of a much needed sense of urgency. 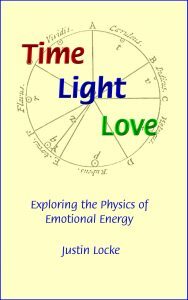 The following article is a chapter from my latest book, “Time Light Love: Exploring the Physics of Emotional Energy.” I am finding that the concept of reducing emotional “ohms” is key to personal advancement, so I offer the chapter here for your amusement. So far we have considered the many variations of emotional frequency or color that occur when the normal flow of energy is blocked and thus put out of balance. At this point we would like to examine another way of thinking about how those blockages occur. When we talk about less than optimal emotions, we usually refer to them as being “negative.” For example, we often hear about negative people, negative feelings, negative thoughts, and negative attitudes. Semantically speaking, this use of the word “negative” is incorrect. The word “negative” does not necessarily mean something is bad. To paraphrase the immortal bard, nothing is positive or negative but that thinking makes it so. Tax deductions are negative numbers, but no one seems to mind them. Negative results from tests for dread diseases are also great news. In a sense, there are negative emotions, but this word should only be used as it is supposed to be used, i.e, as an indicator of the direction of flow. For example, the positive crests of ocean waves are followed by the “negative” troughs of those waves, and this is key for those who enjoy surfing or listening to the sound of the waves. Another example: when a fighter pilot makes a hard turn, he or she experiences “G” forces. The can be positive G’s—pushing him down into his seat—or they can be negative G’s—pushing him up into his shoulder straps. One direction is not better than the other. Most batteries have positive and negative poles—and the negative pole is essential, for without the negative pole there would be no “return” to complete the circuit. So when it comes to emotional energy, truly negative emotions are actually a wonderful thing. If you have positive feelings of affection toward someone, hopefully those same feelings will flow back to you, and if they do, they are negative feelings, as they are traveling in the opposite direction. (The real problem would be if no feelings were returning.) Since that negative flow coming back to you is usually delicious, the word “negative” really should not be used here if we are going to be truly scientific about defining emotional energy. All emotional states that we usually refer to as “negative” are not caused by an unwanted direction of energy flow. Instead, they usually caused by a blockage of emotional energy due to higher than normal resistance. When this state of emotional blockage is labeled properly, i.e., as a degree of resistance, its properties become more obvious, as do the optimal means of counteracting it. If you observe a newborn baby, you will see a near total absence of emotional ohms. Ohms can be “felt” as bad, i.e., “negative,” things because they do block the normal flow of the primary emotional energies. But again, the toxicity is in the dose. The creation and maintenance of emotional ohms is usually accomplished through what are usually labeled as “negative” thoughts. i.e., simply generating fear energy by meditating on an infinite number of ways that people might seek to do you harm. While this ohm-producing process can in fact lessen or prevent your being exploited by people who do in fact mean you harm, the high presence of emotional ohms, that is, the resistance to emotional energy flow, is equally preventative of good energy as well. To lessen the ill effects of emotional ohms, there are many techniques of ohm resistance removal, such as forgiveness, gratitude, clearing the mind, and so on. For example, we tend to think of states such as gratitude as being a feeling, or an emotional state, all by themselves, when in fact such a state is merely a changing of resistance to overall emotional flow. It is really just the opening up the emotional circuitry to the fabulously delicious combined flush of trust, qi, and connection, letting them flow into the feeling of the white light of happiness. You may have been told that “feeling grateful” is key to attracting wealth and abundance to you. There may actually be obvious science in this. If we think of gratitude, not as an emotion by itself, but in fact an act of lessening ohms of resistance to overall emotional energy flow, then its power to let wealth “flow” to you starts to make perfect sense. The “feeling” we call gratitude is actually just allowing a higher amplitude, or even amps or voltage, of all of the three primary feelings. If you go into a state of less resistance, your fullest “glow” and powers of magnetism and attraction and induction will of course function at their highest level, inevitably attracting and manifesting greater happiness and wealth. Of course, along with ohms of resistance, there may very well be ways of measuring the amps (amounts) and volts (pressure in the line) of emotional energy as well. Something to study further. What I’m going to talk about today is normally not discussed in public forums, as it goes way past most people’s comfort zones. It has to do with the somewhat nefarious job of manipulating emotions and actions of large numbers of people, also known as producing propaganda. The average human being walks around with a somewhat self-congratulatory concept of themselves as being a fairly logical and intelligent being. It’s a pleasant image, and I like to indulge in such things myself from time to time, but this is not how things actually work. You may feel insulted by this article, but my intentions are good. When one is tasked, as I often once was, with creating, well, call it what it is, propaganda, I became very goal oriented. I wasn’t too terribly concerned with unintended side effects, or even ethics for that matter. My goal was to create a specific emotional response using visuals, words, and music that would generally lead to people acting this way or that. I was tremendously amoral about my work. I needed the money, and I vas only followink orders. I fear that most of the people who do this work feel the same way. When you do this kind of work, you get very pragmatic. You don’t think about how things ought to be. You think about how things actually are. You observe human beings with a hard cynical eye. You do what you have to do to get the job done, with any tool you can find. There are many tricks of the trade, but here’s one that seems to be near or at the top of the list: It has to do with what I call the protection reflex instinct. Dogs, bees, and primates live in social groups, and we understand that our individual survival is dependent upon the survival of the group. When we perceive a threat to the group, we react instinctually to protect the group. Even cats, not social animals per se, will react violently if you threaten their kittens. It is an extremely common mistake to assume we are logical creatures, and our protection instinct is not the dominant force in guiding our actions. This denial makes us extremely susceptible to being manipulated by those of us in the propaganda industry who do understand its force. For example, if I want you to vote a certain way, or maybe buy a certain product, I’m not going to bother with making logical arguments. Instead, I’m going to present to you a scenario of imminent danger that will cause your protection instinct to overwhelm any rational logical thinking. Animals are willing to sacrifice themselves individually for the survival of the group, and we are animals. Your protection instinct, particularly your instinct to protect those in the group who are weaker, is an extremely powerful force. For those seeking maximum personal power, it’s too tempting a vulnerability to leave unexploited. It would become rather tedious to list all the many threats that people manufacture to manifest protection reactions. You go back a hundred years, there were anarchists, then there were fascists, then there were Communists, and now we have the threat of terrorists. And Socialists. Drugs. The war on Christmas. Perhaps the best example of the power of protection instinct is Pearl Harbor. For 12 years, endless efforts had been made to end the Great Depression, all to little or no avail. But when Japan attacked Pearl Harbor, our protection instinct overrode all of the other forces of mistrust that were causing internal dissension and economic problems. Whenever a dictator seeks to motivate the populace to go to war, there’s a need to manufacture an “incident” of sneak attack that justifies protecting ourselves. And now, whether you are grouped into the handily created simple categories of being on the “left” or the “right,” there is grab bag of threats that can be used to manipulate either group on a grand scale by knowing which group will react to which threat. And once you create a threat, you get to declare war and get lots of money for waging it. “Reefer Madness” was a perfect example– look at all the efforts being made to protect us from drugs. The cure is worse than the disease, but it is very hard to make a logical argument when the protection reflex instinct has been invoked. The manufactured threats that invoke the protection instinct offer yet another bonus: we confer higher social status on those who are willing to go face a threat. We like threats because facing them gives us a sense of status, importance, and purpose. Facing a threat to a loved one is a very popular expression of that love. Thus, if no threat exists, there is motivation to create one. Part of the problem of the greater intellectual discourse is that in order to sell a school of thought, it is important to massage the ego of the audience can tell them how clever they are. The three rules of manipulation are that people like to feel 1) morally superior, 2) intellectually superior, and 3) they like to feel they are socially accepted. When you know these rules, it’s very easy to get people to buy things they don’t really need. I realize I sound terribly cynical, and if you have a fairly high-minded image of yourself, my comments will distress you. But it is very dangerous to think that potential for evil does not exist in every one of us. History teaches that this is so. But even then, while sycophantic comments and flattery have tremendous effect, in laying out the science of manipulating the masses for fun and profit, the protection instinct is probably the most powerful emotional force that one can use. So as you go about your daily routine, just remember, there are people like me sitting in editing suites with oodles of money to buy airtime, thinking up some new version of the weapons of mass destruction. Entire nations, including our own, are formed largely for the purpose of protecting us from outside threats. If the outside threats ceased to exist, the reason for maintaining the nation state becomes wobbly. Hence, nation states must continually seek justification in terms of emphasizing external threats to maintain social cohesion. So the next report you hear of an enemy of the day at the gates, it’s hard, but take a minute and ask, is this really a serious threat to survival of the group? And by the way, who will profit from the protection reflex reactions of the electorate? I don’t do this work any more, but every day I see the work of those who took up where I left off. I am fortunate that I have the literacy to see thru their efforts, but sadly we all live in a society where most do not. When we talk about management fundamentals, this can refer to managing other people, or it can refer to managing your own life. In either case, when you are talking about managing, you are really talking about managing emotions. Managing at the emotional level is a broad topic, but today we are here to discuss one single emotion, and that is … anger. Anger is of course a powerful emotion. It is essential for one to manage it properly, otherwise one risks considerable loss of control. The expression of anger is often rationalized—or even encouraged—because it is often seen as being a state of righteousness and moral superiority, not to mention a feeling of being deliciously powerful. Many people subscribe to this belief, but this is an illusion. Anger does not exist by itself in some sort of vacuum. Anger is always a reaction to, and a symptom of, a sense of powerlessness. Understanding this opposite underpinning is key to managing anger. Invariably, the rotten-to-the-core bad guy seeks to harm the totally innocent helpless child. This nonstop bad-guy nastiness generally goes on for about 85 minutes, until your average-Joe protagonist is finally pushed past his patience limit. In the last climactic five minutes of the movie, we get to vicariously enjoy some serious bad-guy smack-down vigilante justice. Now if the bad guy was not all-evil-all-powerful, and the victim was not all-powerless, the whole exercise would appear somewhat odd. Anger is a specific reaction to a sense of powerlessness. Without the sense of threatened vulnerability to justify it, anger does not even occur. We can all relate to this story line because at some level, we all feel like an innocent victim sometimes. Most of us tend to be far more aware of our own vulnerability and weaknesses than we are of those of other people. We also tend to see others as being far more powerful than they really are. Our anger response feels good, at least for a moment, and as a result, anger becomes a common part of our modern political discourse, as well as our entertainment, and is becoming more so. While we usually speak of anger as something to be “managed,” i.e., controlled within ourselves, there is just as much technique to be appreciated in the cultivation of it . . in other people. Inciting anger in others is a handy, if morally ambiguous, management tool. Putting people into a state of fearful outrage is a great way of keeping them off balance and encouraging confrontation among factions that might otherwise unite against you. Many people incite anger to advance their cause. Like Iago, they will tell you stories of your vulnerability and/or trust being abused by their political opponent, making you fly into a rage where you can no longer think calmly and rationally. It’s easy to get caught up in this kind of thing, so it is important to see these things as what they are, i.e., commonly used manipulative ploys. If you have just been told of an extreme abuse of evil power, and it makes you angry, always take a minute to think about it. It is tempting to indulge in the immediate easy fantasy of indignant righteousness. It is easy to automatically fly to a state of defending an innocent victim from extreme attack. But if you remain calm and objective, you will always be far more capable of coping effectively with the situation, even if the accusations are true– which they seldom are. If you believe that a state of anger is the only way you can feel empowered, then you face a nasty conundrum: you have to increase your fear in order to achieve that greater anger. Amplifying your sense of powerlessness in order to make yourself feel empowered is somewhat contradictory. Anger promises power, but never really delivers. It’s a classic vicious cycle. Since anger is a marker of a sense of powerlessness, this is a handy thing to know when dealing with an angry person. Instead of taking their anger at its face value, try to step back and see the underlying cause, i.e., the sense of powerlessness in them that is causing it, and address this problem at its root. Look past the anger and see the innocent victim beneath. Try to calm them by pointing out what power they do have. Anger is not noble, nor is it evidence of moral superiority. Anger is a state of trying to compensate for a perceived lack of power. It functions as an escape from reality, much like alcohol. No matter what the problem is, you are more powerful than you think. Calm reflection and persistence are always more effective, both in solving any problem, and in drawing more supportive energy to you.